Designed for professional photographers and videographers, the 64GB Power UHS-II SDHC Memory Card from Delkin Devices features a storage capacity of 64GB and takes advantage of the UHS-II bus to support maximum read speeds of 300 MB/s and maximum write speeds of 250 MB/s. This card has also been designed with the V90 Video Speed Class rating, which guarantees minimum write speeds of at least 90 MB/s. All of this allows for users to capture 8K, 4K, 3D, HDR, high-speed and high-frame-rate recordings, and multiple video streams created by 360° cameras. It has also been approved for real-time broadcasting and supports data-intensive simultaneous captures, such as raw and JPEG, as well as video, still, GPS data, and time-lapse. UHS-II media achieves its speed through an extra row of pins and while this card has been designed for cameras that are UHS-II / V90 compatible, it may be used in devices that do not support UHS-II / V90. However, bear in mind that this card will then default to your device's speed class and bus rating, such as UHS-II and V60, which supports minimum write speeds of 60 MB/s, UHS-II and V30, which supports minimum write speeds of 30 MB/s, or UHS-I and U3, which also supports minimum write speeds of 30 MB/s. If your device does not support U3, this card is compatible with the U1 and Class 10 standards, each of which guarantees minimum write speeds of 10 MB/s. 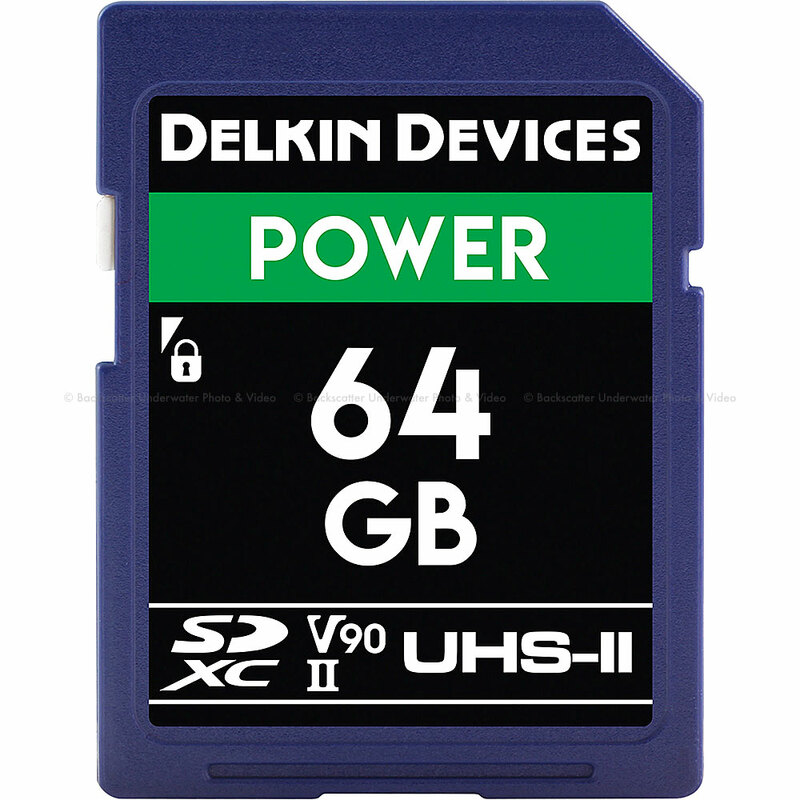 Built for extreme conditions, Delkin's 64GB Power UHS-II SDHC Memory Card is protected against water, shock, and x-rays, and also features built-in error correction and wear leveling. A built-in write-protect switch helps to safeguard your content from being erased. Included is a protective storage case. Rated Video Speed Class 90 (V90) and utilizing two rows of pins, the Power SD card boasts recording speeds of up to 250 MB/s for uninterrupted 8K, 4K, 3D, HDR, 360°, and high-speed video capture. The card guarantees a minimum sustained write speed of 90 MB/s, allowing for simultaneous multi-file recording and ensuring that data is written swiftly and safely to the card. It is also approved for real-time broadcasting and supports continuous-burst shooting for capturing rapid-fire raw shots. Capable of offloading data at speeds reaching up to 300 MB/s, the Power SD card ensures a quick and efficient data transfer from card to computer for immediate access to your files and faster post-production start times. This is well-suited for photographers and videographers who need to quickly unload large amounts of data and get back to shooting. Built to endure strenuous shooting environments, the Power SD card is durably designed to be waterproof, shockproof, and x-ray proof. In addition, the card also utilizes built-in error correction and wear leveling to help ensure data integrity and a long lifespan. Each card is furthermore backed by a Lifetime Warranty and Delkin's American-based customer support team. Utilizing the latest speed class technology, the POWER SD card boasts the fastest available speeds and supports data-intensive modes, including 8K video.